If you seem to be struggling to get new business from your current contacts this post will provide you with some tips on how to effectively follow-up with past, present and prospective business contacts. Do you find that most of your phone calls go unanswered or go straight to voice mail/answer machine resulting in no replies? Do you wonder if your e-mails are being read or, due to over-aggressive spam filters, are your e-mails winding-up in your clients’ ‘bulk’ or ‘junk’ mail folders so not read at all? Then there is also the possibility that the e-mails that do get through may never be opened or replied to or are simply be deleted. With people now receiving hundreds of e-mails per day they are becoming increasingly more and more indifferent to e-mail marketing due to the amount of spam e-mails they receive. To be successful, in a world where everyone leads increasingly busy lives, as a business owner or sales person, you need to be a master of consistent follow-up. The most effective follow-up method for ANY business is by sending a greeting card or postcard as it is a much more personal form of communication. It is also something that not many of your competitors will be doing. They are always delivered, opened and read. 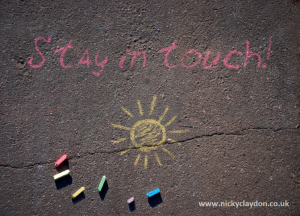 You can begin to send cards and postcards to build rapport with your contacts, rather than looking for new ones, by sending them to: past customers, existing customers, potential customers and your VIP customers. By using your contact’s first name, personally signing each card with your own signature and sending a series of cards, you will be able to keep yourself at the forefront of your contacts’ minds for when they are ready to do business with you or refer someone else to you. You don’t have to labouriously sit and write every card or postcard as there are now automated systems that do this for you but still give the look of the personal touch. Would you be interested to find out more? If so, please contact me via e-mail and I will get straight back to you to talk you through how to put this great system in place to automate your follow-up system resulting in more business and referrals, without obligation. Do you have a QR Code for your business? Have you got a QR code to promote your business – if not, why not? It might be that you don’t even know what a QR code is. If not, a Quick Response (QR) Code is a machine-readable code consisting of an array of black and white squares typically used for storing a URL (Universal Resource Locator – the address of a web page) or other information for reading on the camera of a smartphone. The QR Code doesn’t necessarily have to be a video you could also transfer a document for your customers or potential customers to read via their phone in this way too. You will, probably, be aware that video is, by far, one of the best ways to promote your business, because people get to meet ‘you’ in a video and people tend to do business with people that they know, like and trust, so video is a great way of people meeting you, virtually. If you have a video that you can promote your business with you should use it in as many ways possible and if using a QR code isn’t something you’ve thought about before, why not look into it now. 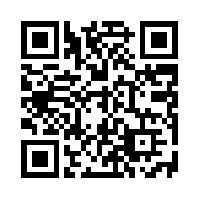 It is quite easy to transfer your video to a QR Code. There are many places that you can do it for free over the internet and my greeting card company also provides this service, for free, so that you can then download your QR code onto a greeting card. My company also has a useful set of instructions that can be incorporated in the card so if your contact doesn’t know how to download the video it tells them exactly what they need to know to do this seamlessly. If you haven’t already got a QR reader on your phone I-Nigma is a free App to download for Iphone or QR Droid is a free App for Android. Once you have downloaded one of the free Apps all you need to do is hover over the code using the camera on your smartphone until it is completely visible on your screen. It will then automatically swap your phone to YouTube, via the internet connection on your phone, and play the video. How clever is that! 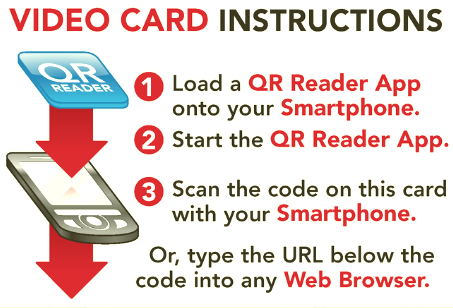 Included on the inside leaf of the card are all the instructions on how to install a QR reader and download the video just in case someone is unsure. Card and postcard marketing isn’t the only way to utilise QR codes into your marketing strategy, you could also include them in e-mails, leaflets, etc. It would be great to hear if you have already incorporated QR coding into your marketing strategy and what successes you’ve had to date. Please comment below. If you are a professional or amateur photographer, artist or designer, I thought I would write this blog especially for you! 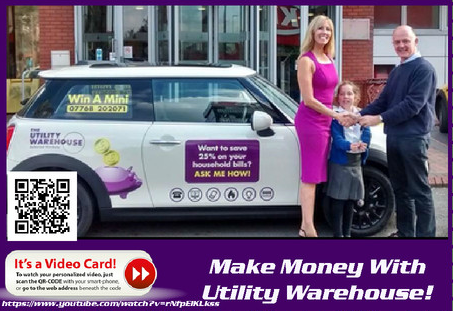 Have you ever considered Postcard Marketing for profits?